Looking for the latest WhatsApp Tricks? 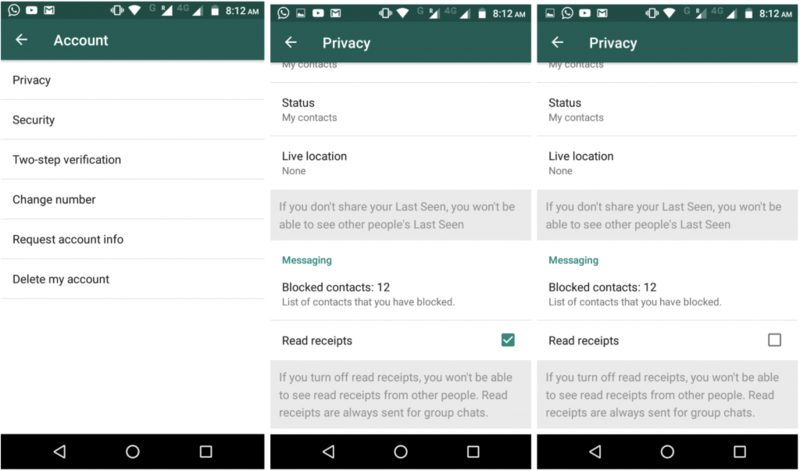 There are loads of tricks will make your WhatsApp use easier and time-saving. 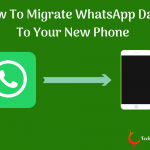 In this article, we will show you new WhatsApp Tricks that will change the way you have been using your favorite messaging app. 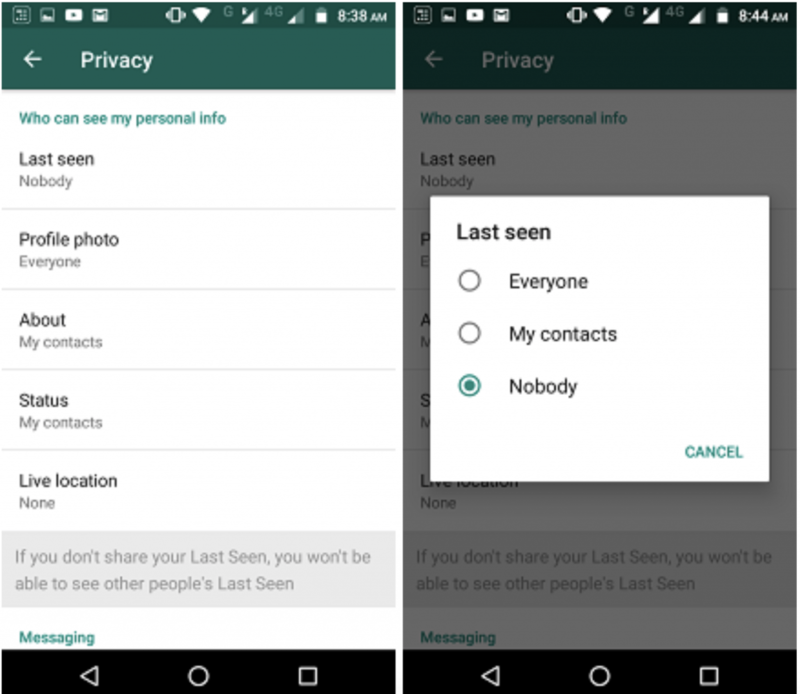 From sharing location feature to looking for media files and disabling last seen feature, here are 12 useful and updated WhatsApp Tricks that you should know. WhatsApp allows you to back up your recent chats and media through a cloud storage service that can retrieve the last backed up conversation when you switch your device. 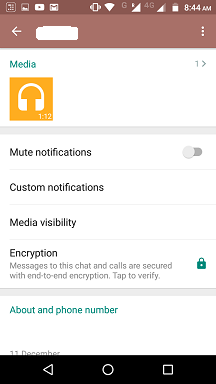 You can set WhatsApp to automatically backup chats around midnight. You can find this option under Settings > Chats > Chat Backup > Auto Backup. 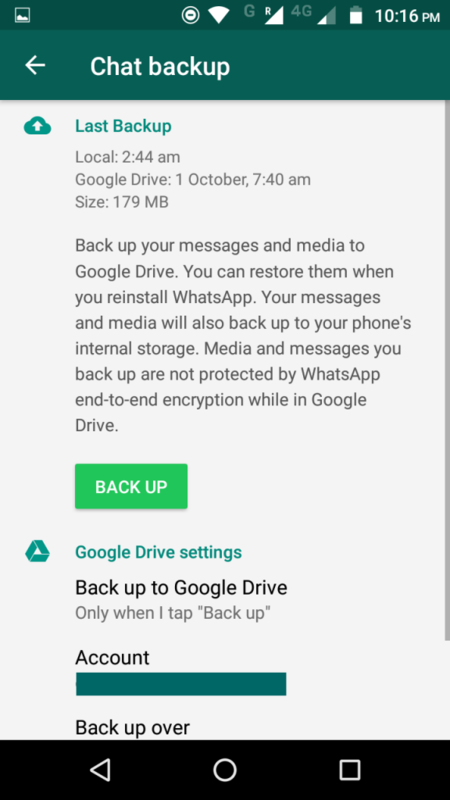 WhatsApp uses Google Drive for backup in Android and iCloud in case of iPhones. If you are migrating your phone and you need a backup from 11 AM rather than 02 AM, you can manually back up data. 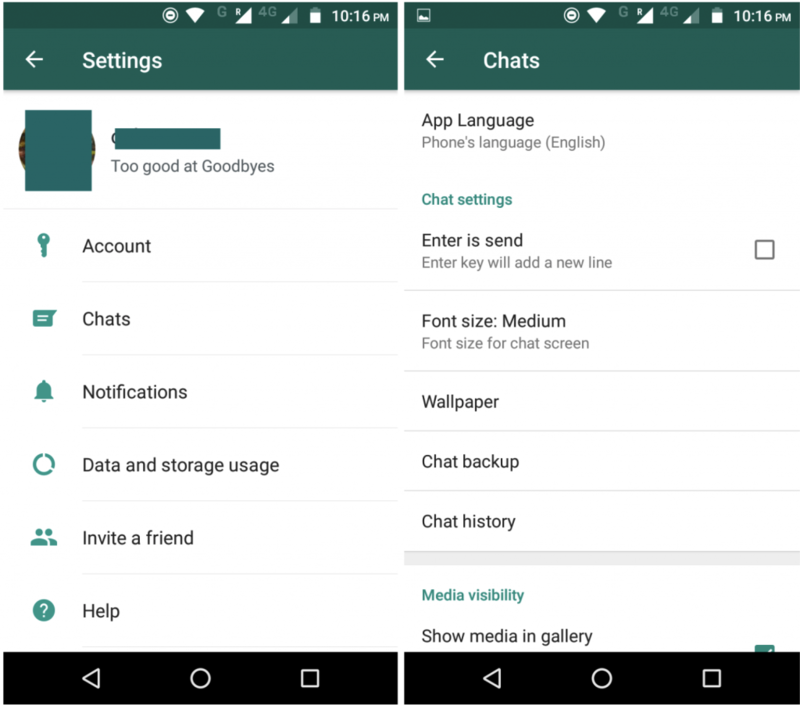 For a detailed version of how you can migrate WhatsApp chats read here. WhatsApp now has a new feature: Blue Ticks. If you enable blue ticks feature, the delivered ticks will turn blue once the recipient sees your texts. 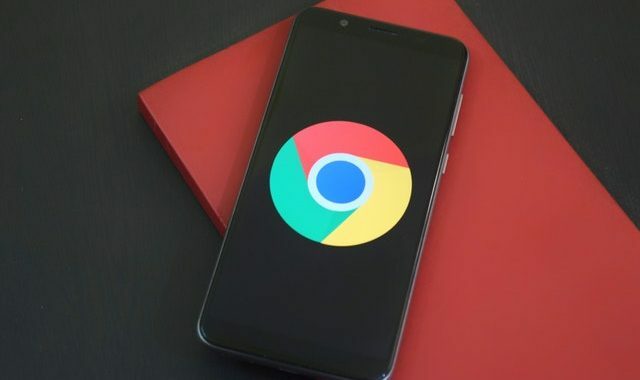 For Android phones, you can easily do this by putting your finger on the particular text and then swiping right to the left. 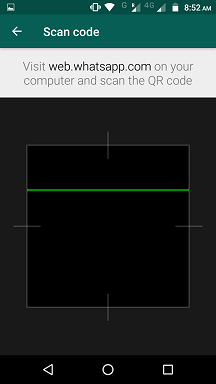 Tap on the text and then tap on Menu button > Info. Go to your Whatsapp application and click on Settings. Choose Account and select Privacy. Under Messaging, check the box that shows Read Receipts. Note: You turn off Read Receipts if you do not wish others to see if you have read texts and not replied. Although, if you turn off read receipts, you won’t be able to see other people’s read receipts. It’s a two-way road. It is a great feature that helps you to share your real-time location or current location. If your recipient is coming to visit your place or vice versa, you can enable live location. Now, you have the option to choose your real-time location between 15 minutes, 1 hour or 8 hours. If the current position is shared, you and the recipient can track the location and easily find each other in crowded places. How to enable location sharing? Go to Whatsapp application and select the contact to which you wish to send the location. Click Attach symbol and select Location. You can select Share Live Location or Current location depending on the needs. 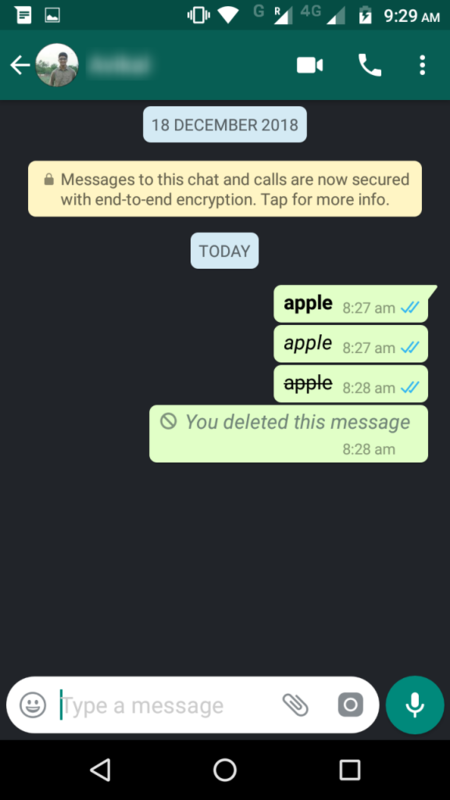 The Delete Message option has been the latest boon by WhatsApp for every user. The new delete button enables you to delete a message if you sent that message by mistake to a person or group. 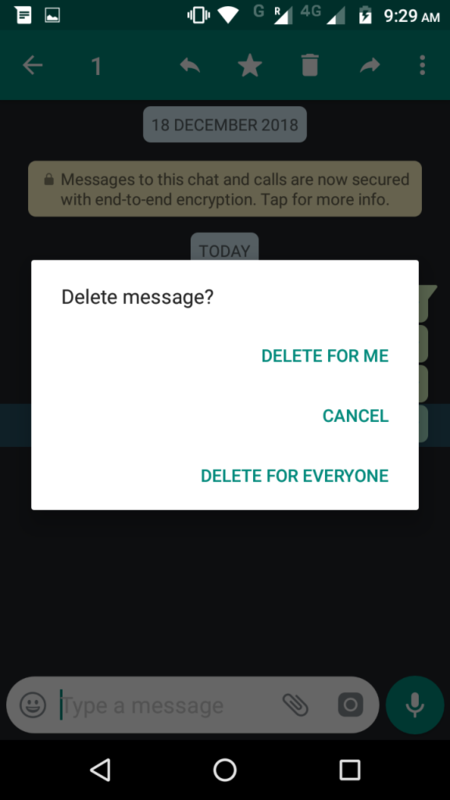 The ‘delete for everyone’ option allows you to delete texts for personal chats or group messages. You can see this option if you long press the message you wish to delete. Once you tap a text, options like Delete Message for me, and delete message for everyone will appear. There is a time limit to delete the message else it will get delivered. 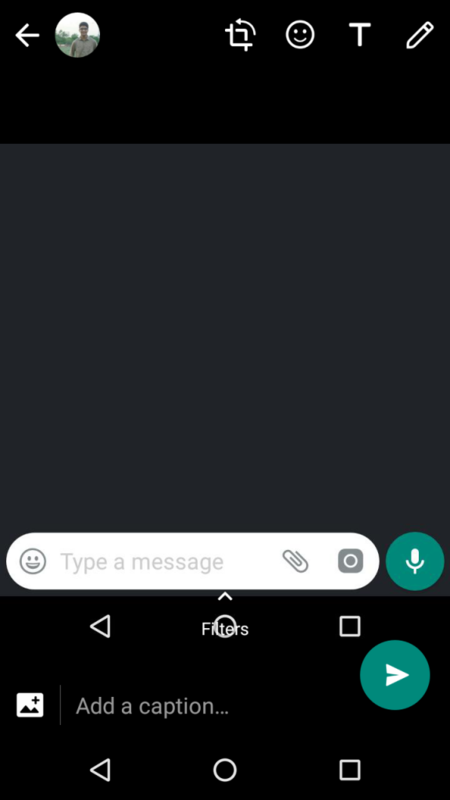 You need to remove the message within 7 minutes from the sent time. It was seven minutes and later on extended to sixty-eight minutes. It’s worth mentioning that this works only if both the sender and receiver are using the latest version of WhatsApp. 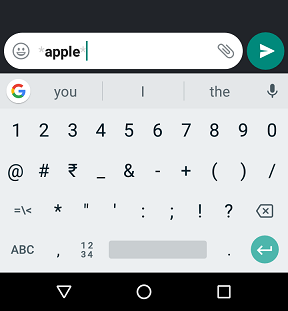 To reply a specific text from the chat, swipe the text right, and you can type your text as a reply to the particular text in the chat. This feature can be used for both group chats and individual chats. 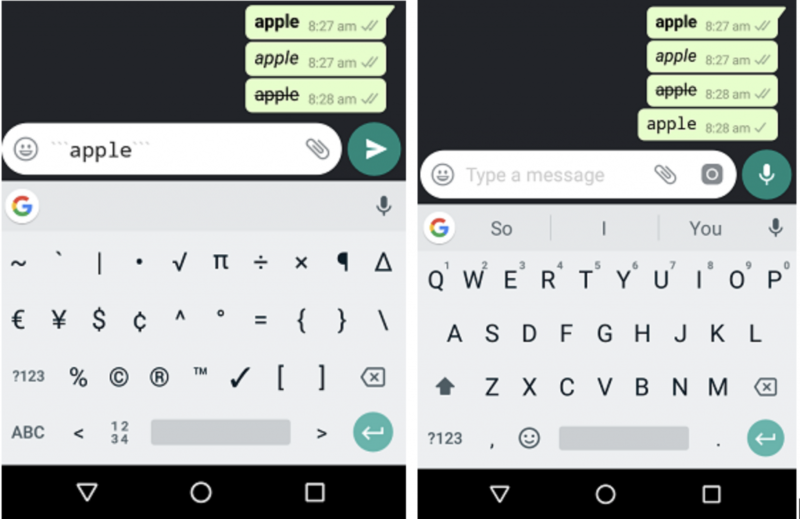 A new WhatsApp feature allows you to format the text in three different ways. The three formatting techniques are: bold, italicize, and strikethrough. You can also use different fonts. It is an excellent feature for differentiating the text used in a message. It is an easy and quick method if you are using WhatsApp for professional purpose. Interestingly, you can also use various fonts in your text. To write in a different font: You need to add three symbols at the front and end of the text. For example, type ‘‘‘apple’ ‘‘to display it as ‘an apple a day’. Have we always somehow stayed connected to school/college friends or family members? But a video call makes more sense right? Having all those faces live on your phone after a long time is sometimes all we longed for. In the older version of WhatsApp, you can make a video call to only one person. Now WhatsApp has enabled group video calling feature where you can make video calls to groups. 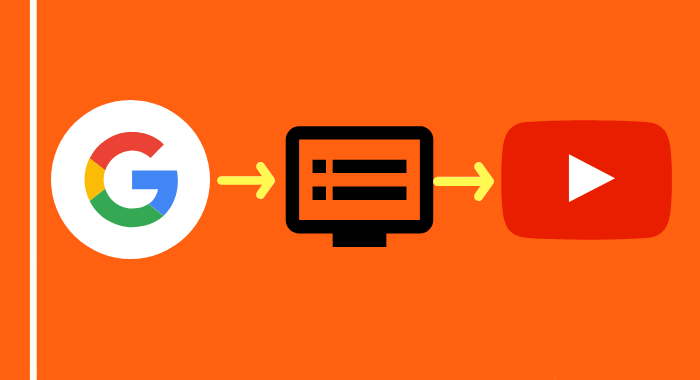 How to make a group video call? Open your Whatsapp application and select a member to start a video call. It connects, rings and the video call connection to that friend is established. Now select the plus icon by which you can add the second recipient. When the second recipient gets added, you can add the third by clicking the plus symbol. Or you can directly make a group call directly to a Group Chat. WhatsApp now allows you to crop and edit images before sending and you can also trim a specific part of a video before sending to a person and even turn it into a GIF if you wish. Select the image you want to send, and then you can crop the image or add stickers and text before uploading it as a story or sending to a person. Likewise, before you send a video, you can trim it. You see this option at the top before posting the video. WhatsApp introduced the Pin Chat feature in May’18 for Android users and July’18 for iOS users. By this option, you can pin up to three chats at the top of your WhatsApp chats page. This means, no matter how texts or group texts you receive, these three chats will stay on the top. That is even if, there are no messages from any of the three pinned chats. To pin a conversation in Android, tap and hold on a specific chat, you will see a menu appearing on the top. Tap on the first option that is the pin icon. You can also unpin the chat by tapping and holding the conversation, and again clicking on the pin icon. iPhone users can swipe right to pin and swipe left to unpin a chat from chat list. Are you part of groups where you get numerous important links, images, documents that need to be accessed a lot? Looking for media files from Files Folder is like searching for a needle in a haystack. 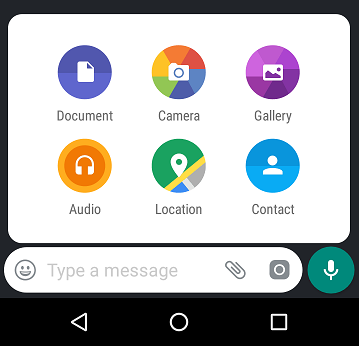 But the new WhatsApp feature lets you look for media files for each group or personal chat quickly. All you have to do is, go to Group Info > Media. Here you can quickly look for Links, Documents and Media. There are times when you don’t want people to know when you were last using WhatsApp. You can turn off the Last Seen Option from Settings. Go to Settings > Account > Privacy > Last Seen. Once you tap the last seen option, you will have three choices. Tap on Nobody to make sure no one sees your last seen. Note – This will simultaneously turn off other people’s Last seen too. Meaning, you can’t see when your friends and colleagues were last using WhatsApp. WhatsApp Web allows its users to use WhatsApp on your laptop or computers. 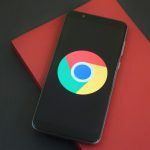 The only condition is, no matter where your phone is, it should be connected to the internet. 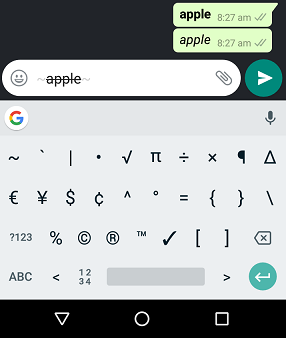 WhatsApp allows to set up a virtual WhatsApp on your desktop where you can use all it’s regular features apart from one. 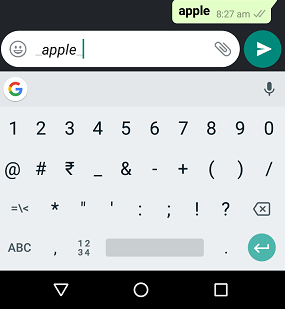 You can’t yet pick calls via WhatsApp web. 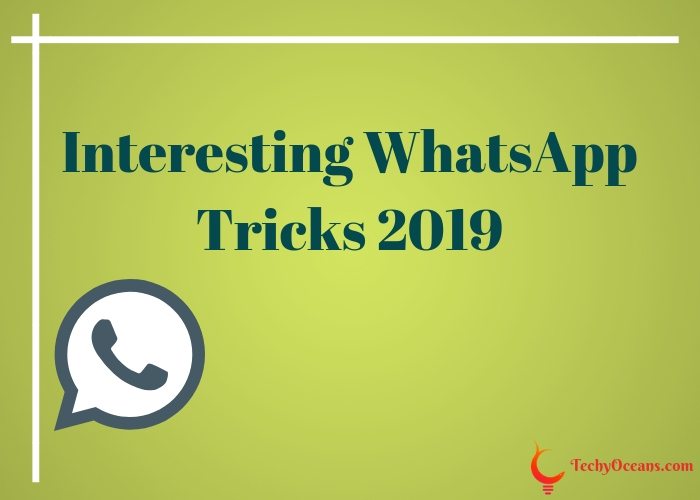 We hope you find the above WhatsApp tricks worth and useful. WhatsApp keeps releasing new features, and with every latest updated version, there are some cool WhatsApp tricks involved. We shared the best tricks here that you could be handy for you while using the app. We would keep updating this post frequently whenever there is a new WhatsApp trick. 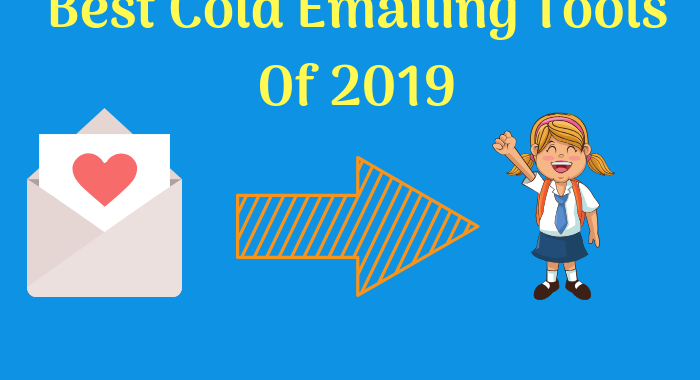 If you know any other cool tricks that we should include in the post, feel free to let us know below.